Yesterday morning wasn't too exciting. The other day, I booked a plane ticket to Seville for $43.00 (It was like 40 Euros so that seems like an appropriate conversion rate). With a bag it was about $55.00. I put my name down wrong on the ticket. First name showed up as DavidPearlman, and last was DavidPearlman. This was wrong, obviosuly. I tried to call the airline, Iberia, from the hotel (my cell # only works on wifi, and the phone calls are intermitent). Picture trying to reach a live person at American Airlines, and compound that with language differences, using a hotel phone in a different country, etc. I didn't reach anyone, couldn't press 2 because 2 wouldn't work, etc. All I did was manage to be charged 8 Euros and change for making a phone call. So I took the Metro to Iberia's customer service office at the airport. The ride wasn't long, maybe 35 minutes. Finding their customer service office wasn't long-maybe 5 minutes-the wait on line WAS long. Their we're 3 people working for a line of about 15 people, which wouldn't be too bad, but it seems like each person spent about 10 minutes talking with the rep(minimum). And after the rep was done helping someone-they seemed to take a break and disappear. Eventually, after 45 min or so (I think)-I got to the rep-she informed me shouldn't have a problem getting on the plane-since it was a short domestic flight-and there are no name changes with the tickets I have anyway. I decided to take her word for it-so I will see tonight-the flight is at 10:00 pm. Yesterday afternoon, after the airline, I came back to the hotel and rested. At 6:00-I left the hotel to go to a Museum called the Reina Sofia-which the tour guide from yesterday recommended. The museum is free for 2 hours before closing (7-9 pm). I found out when I got there that isn't a secret-there was a long line to get in. The museum was actually pretty cool-there we're Salvador Dali's, and even an interesting print called the Journey, which is like my Journey-it made no sense. The reason she recommended the Museum is a very large painting by Picasso called Guemica, which was a town in Spain, mainly of woman and children, which Hitler dropped bombs on and killed anywhere to 300 to 1600 people. It was quite big and touching. After that, I went to a Flamenco show-I don't care about dancing, but this is Madrid so I figured i would check it out. It was fine. The people we're good. Now I can say I saw it for $30.00 (included a glass of wine). 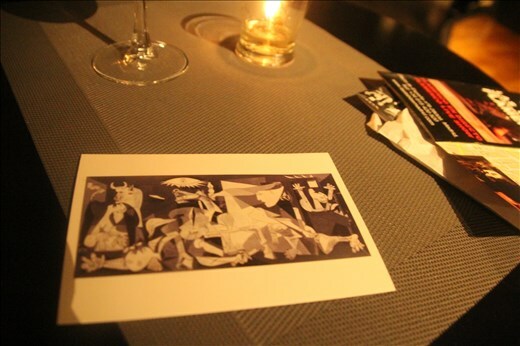 BTW-the pic is a postcard of Guernica, taking on the table at the Flamenco show.